Ladies, Hat's Off To Geraldine Lucas!! The ladies roots go deep in climbing too. In these days of the Steph D., Catherine D., Lynne H. and all the hard cores I don't even know about, we don't often think of what it took to be a woman climber back in the waaay back machine. Geraldine Lucas was determined to overcome the frontier attitude toward women. She was told that women didn't belong "up there". 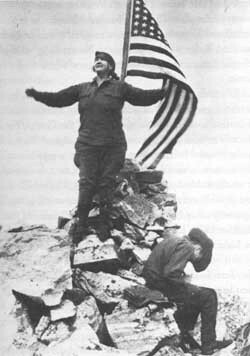 She even had to be "hoisted" a bit by Paul Petzoldt, but there she was in 1924 on top of The Grand Teton at age 54. This was only the 6th ascent of the Grand Teton. Petzoldt was impressed with her intelligence, her attitude and her toughness. He guided her to the top when he was only 16 yrs old. Only six ascents of the Grand, and already Paul had done three of them. Good job Geraldine! Hats off! Geraldine was born in 1866, had a degree and was a teacher in NY until her retirement in 1912. 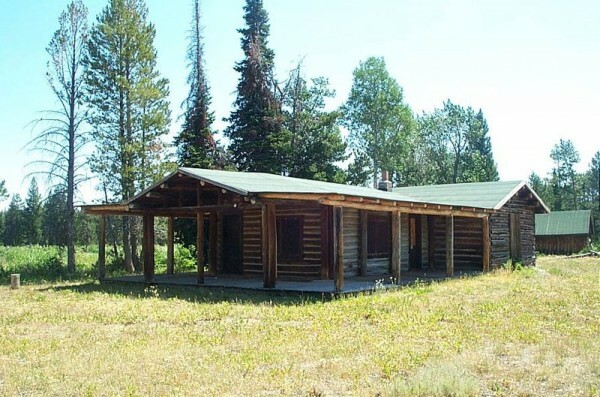 She and her brothers acquired prime Teton property and they built her cabin in 1913. She was eventually granted homestead and had 428 acres. This is where Paul Petzoldt first met her. There are interesting references to Geraldine in Bonney's The Grand Controversy. Are gentlemen also allowed to take their hats off to Ms. Lucas? What kind of interesting references in Grand Controversy? Anders, of course the gents may tip the hat as well. I was only trying to draw attention of the gals for a gal/history thread! Individuals trespassing her property irritated Geraldine. She often bolted out of her cabin and shouted at them. She seems to have granted climbers free passage though. The book mentions a few of these encounters. The Bonney's claim she was 59 at the time of her Grand Teton ascent. The book gives an excellent climbing history of the peak to about 1935, including a detailed examination of the first ascent controversy and numerous early photos. I'm not sure if the book is still in print. If you can't access a copy I'll loan you mine. I could have sworn PP said she was 54, but if she was born in 1866, she would've had to have been at least 58. Pretty damn rugged if you ask me. In those days? With some of the attitudes about women? When the peak had only been climbed the first few times? Awesome. PP said she was pretty weak when they got back to low camp, but made it under her own power and was in high spirits. Yeah I bet!! Scan that bad girl up! Or maybe just a link? that it was a gal thing. In Jackson, the day after Owen's first aborted 1924 climb, Petzholdt got a phone call. It was from Geraldine Lucas, calling from her ranch on Cottonwood Creek, south of Jenny Lake. She asked him to come up to the ranch to see her about something important. When Petzholdt reached her doorstep, Mrs. Lucas, ever outspoken, immediately got down to brass tacks: "If that old sonavabitch (Owen) can get up the Grand, why I can too! Will you take me up?" Petzholdt couldn't help but laugh. "I mean it," she stressed, her chin jutting out with determination. "Sure, I'll take you up. When?" So Petzholdt rounded up Ike Powell and his horses once again, and persuaded Willie Crawford to come along because he figured he'd need a lot of help. The two Deloney girls from Jackson also agreed to go to lend moral support to old "Aunt Ger," as many people called her. The next day they packed Mrs. Lucas up to Moose Meadows. From there the group hiked up to the caves by the falls that Petzoldt had spotted on his last trip, where the ground was level enough for sleeping and there was enough wood for fires. He knew that the only way to get Mrs. Lucas to the top was to camp as high as possible, and the now famous Petzoldt Caves were thus used for the very first time. That same day two men from the town of Kelly, in Jackson Hole, heard that the Owen party had just returned from scaling the Grand. Their interest was sparked, and a new expedition began when Albert Gunther casually remarked to Allen Budge, "Let's go climb the peak!" "All right," Budge replied, so Gunther walked over to the phone and called two buddies, Joe May and Frank Edminston, who also liked the idea. In no time flat the four tossed blankets, boots, food, and a box camera (loaned for the occasion by Budge's mother) into Budge's truck and, after a quick stop at the Kelly Mercantile for more supplies, headed west to Jimmy Mangus's place, where they left the truck. There they rolled their gear into bedrolls, tied ropes on the ends, and slung them over their shoulders like backpacks in the old army fashion. At 5:50 PM they started up the Bradley-Taggart Lakes trail, still in their shirtsleeves. One of their bedrolls contained an American flag, and the four took turns carting up a ten-foot wooden pole to hoist the flag. Climbing the ridge between the two lakes, they crossed west of Bradley Lake into Bradley Canyon and headed up to timberline, where they camped high in the upper meadows that night. What they didn't know was that only two hundred yards above them, and just around a rocky point , was the Lucas party. The next mornng the Kelly group rounded the rocky point and was astonished to find the Deloney girls camped at the caves. The girls told them that Aunt Ger was already on her way up the peak. Hurrying on, the four men caught up with the slower moving Lucas party at the Lower Saddle, and they all joined forces. Petzoldt was glad to have the extra manpower because he was beginning to think he needed more help, and the Kelly men were happy because they had neglected to bring a sturdy rope in their rush to pack. Budge noticed that everyone in the Lucas party had hobnailed boots, but he felt confident in his own Red Ball composition-soled boots. He was sorry though that his group had forgotten to bring jackets of some kind. When the whole party eached the Upper Saddle, Petzoldt pointed out the Enclosure, and the Kelly men scrambled up to the well-known structure perched on top of the West Spur. But this turned out to be a mistake. Just looking at the great west wall of the Grand towering above them proved to be too much for Gunther, and especially May who was already feeling dizzy from altitude sicknbess, and Gunther announced, "This is as far as I want to go." May quickly agreed. Edminston turned to Budge and asked, "Shall we go on?" "Well that's what we came for, didn't we?" replied Budge. The two hurried back down to catch up with Petzoldt and the rest of the party, who were busilly involved with getting little old white-haired Mrs. Lucas to the summit. At that time Geraldine Lucas was fifty-nine years old, a chunky, solidly built, overweight woman driven by an iron will to succeed. According to Petzoldt, "She was probably the least fit of anybody I ever took up the Grand." Taking her cue from being Billy Owen's claim to be "the first", and never believing for a moment the rumors that another woman had already climbed the Grand, Mrs. Lucas was determined to be the "first woman" to climb the peak. It was this incentive that got her to the summit, and noithing else. Petzoldt began by tying Mrs. Lucas into the hundred-foot, 3/4 inch manila rope he's brought along for the purpose. He then went ahead through the Crawl and was followed by Edminston and Budge, the latter squirming through, pushing his bulky camera ahead of him. "They tried to talk her out of it. It was so hard to take her along--she was such a big woman. Right when she was going into that Crawl she scared everyone to death--she was so big that part of her was hung over the edge of it. She wanted to climb it so bad that fear was nothing at all. She thought she was going to be the first woman up there, and that's all she thought of. We tried to talk her out of it, but she just kept a-going." Unable to crawl on her stomach like the others, she "just had to kinda work her way, then rest, then work her way a little farther, with most of her heavy body hanging out over the edge and that terrible drop below. Just watching her, I know that was the scaredest I was on the whole trip. After watching her most anyone would have backed out." The next test of her iron will came at the chimney. This she painfully climbed while Petzoldt pulled on her from above with the rope and Edminston and Powell pushed her from below. They had to place her feet on the footholds and hold them there to keep her from slipping. "She had no balance, she had to be steadied all along," remembered Petzoldt, " But she had terrific determination. She was quite a gal." This was Ike Powell's first climb as well. "Ike had a very bad leg; it was much shorter than the other, yet what he did in the outdoors was just miraculous," reminisced Petzoldt. At one point above the Crawl, Powell slipped and couldn't move. Edminston was just below and carefully helped him find toeholds without getting mixed up in the rope. As soon as Powell got beyond this spot, however, he had no further trouble. Not far above, Budge found remnant strands of the copper wire that Scott and Petzoldt had left lying around after their earlier measuring efforts. About midafternoon the six climbers finally reached the summit. A cold wind was blowing, and the two Kelly men, still in their shirtsleeves, had to shelter behind some rocks. Mrs. Lucas, tired as she was, started to recover as soon as she was actually on the summit. "I did it! I did it! I did it!" she repeated excitedly, as if she couldn't believe it herself. Owen's metal flag was still there. The summit record was located and the entries read aloud. When the name Eleanor Davis was pointed out to Mrs. Lucas, according to Budge, "She was quite put out about it. She didn't believe it. She said that somebody had just written that name in the record. I don't believe she ever believed it. She was probably the oldest woman to climb it, probably made the record that way." Petzoldt and Budge pulled out their respective cameras, blew the dust off, and took pictures to make the climb "official." Mrs lucas prepared for the historic occasion by throwing her arms out and saying, "Thank the Lord I made it." She was so thrilled that more pictures were taken of her holding the flag brought up by the Kelly pair. During the hour they were on the summit, the Kelly men kept warm by gathering rocks to build a pyramid three or four feet high, large enough to hold their ten-foot pole upright with its streaming American flag. Meanwhile, Powell and Crawford took turns cutting Mrs. Lucas name on a rock with a small cold chisel. When Edminston asked if Budge also wanted to chisel his name inthe rock, Budge replied, "Hell no!" He was so cold that all he could think about was going down. Petzoldt realized they couldn't stay long on the summit. He could foresee big problems if they got caught in the dark with Mrs. Lucas in tow before they got back to the Upper Saddle, so he urged everyone to start on down. They went slowly, picking their way through the rocks. Back down at the chimney, Mrs Lucas descended the same way she had gotten up, with help from above and below. All but Budge, who was the last to descend, used the rope as a hand line. Although Crawford had actually been hired to climb down last, he was so scared that Budge told him to "go ahead and I'll bring the rope." Without much coaxing Crawford grabbed the rope and went right down. Budge then untied the rope, dropped it, and climbed down, facing inward, with someone at the bottom on each side in case he slipped. Petzoldt felt a tremendous surge of relief when they all safely reached the Upper Saddle. From that point on, Mrs Lucas was supported on both sides all the way down to the caves, where she and the remainder of her party arrived at 2 AM. The Kelly men left the group at the Lower Saddle and took off at a run, hoping to get down off the mountain that night. Leaping over crevices from one jumbled boulder to the next, they reached their bedrolls at timberline and then decided it was too late to make it out afterall. Up early the next morning, they hurried down Bradley Canyon and out through the timbered lowlands onto the flats, where they eagerly turned and looked up at the summit. There it was--their flag flying atop its ten-foot pole. The whole climb had been worth it! Allen Budge was always glad he had climbed the Grand Teton. He later said, "Paul climbed because he liked it. I climbed because I wanted to say I had been up there. I never lost anything up there and never wanted to go back."